From its location in the 1851 census, Foan’s Buildings was a ‘court’ of low cost housing “in Middle Street above the Wesleyan Chapel". By the time of the 1886 Ordnance Survey Foan’s Buildings were called Wesleyan Place. The buildings were not shown on Watts' map of 1806 but had been built by the time he produced his map of 1831, thereby approximately dating when they were built. As seen on the Ordnance Survey below, Wesleyan Place was a pair of dwellings, completely enclosed and set behind the Salvation Hall (Wesleyan Chapel) in Middle Street. They were reached via steps in Middle Street and then an alley between the Salvation Hall and Ebenezer Terrace. It is not known when Wesleyan Place was demolished but the buildings had been replaced by commercial buildings by the time an aerial photograph was taken in 1928. 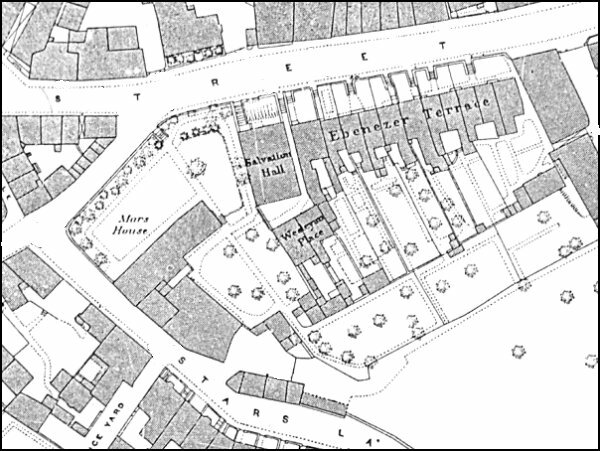 Watts' map of 1831 shows Ebenezer Row next to the newly-built Wesleyan Chapel, shaded deep brown. Behind the chapel are Foan's Buildings. 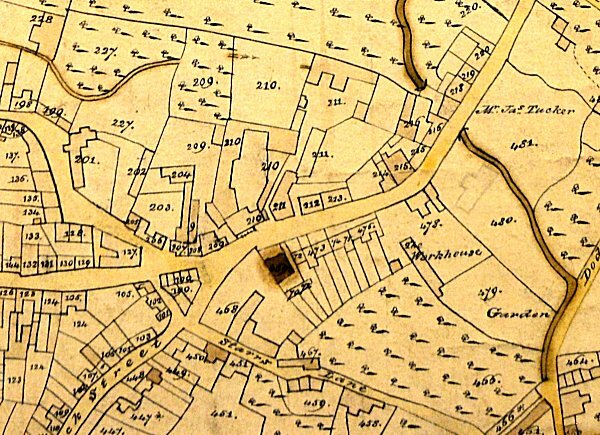 The 1886 Ordnance Survey showing Wesleyan Place at centre.